For other uses, see 2018 World Series (disambiguation). The 2018 World Series was the championship series of Major League Baseball's 2018 season. The 114th edition of the World Series was played between the American League (AL) champion Boston Red Sox and the National League (NL) champion Los Angeles Dodgers. The Series was televised in the United States on Fox. This was the second World Series match-up between the two franchises, after the Red Sox defeated the Brooklyn Robins (later known as the Dodgers) in five games in 1916. The Red Sox beat the Dodgers in five games to win their fourth World Series title in 15 years dating back to 2004, and their ninth in franchise history. Steve Pearce won the World Series Most Valuable Player Award, while Alex Cora became the fifth first-season manager and first manager from Puerto Rico to win the World Series. The Series was notable for its third game which went for 18 innings, a World Series record. Additionally, the Red Sox became the first team to win two World Series exactly one century apart, as they had defeated the Chicago Cubs in 1918, while the Dodgers were the first team since the 2011 Texas Rangers, and the first NL team since the 1992 Atlanta Braves, to lose consecutive Fall Classics. The Boston Red Sox' most recent World Series appearance was their 2013 win over the St. Louis Cardinals. 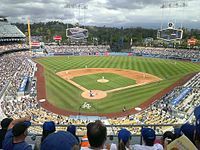 The Los Angeles Dodgers, who last won a World Series in 1988 over the Oakland Athletics, made their second consecutive appearance, after losing to the Houston Astros in 2017. The two franchises faced each other in the 1916 World Series; the Red Sox won the series in five games against the then-Brooklyn Robins. Red Sox manager Alex Cora and Dodgers manager Dave Roberts were teammates on the Dodgers in 2002, 2003, and 2004. Although they did not play together on the Red Sox, both managers played and won a World Series championship with Boston—Roberts in 2004 and Cora in 2007. This was the first World Series with two managers of color; additionally, both managers were born outside the contiguous United States, as Cora was born in Puerto Rico and Roberts in Japan. The Red Sox finished with a 108–54 (.667) record, winning the American League East division title for the third consecutive season, eight games ahead of the second-place New York Yankees, and were the first team to clinch a berth in the 2018 postseason. The Red Sox surpassed the 100-win mark for the first time since 1946, broke the franchise record of 105 wins that had been set in 1912, and won the most games of any MLB team since the 2001 Seattle Mariners won 116. The 2018 Red Sox were highlighted by All-Stars Mookie Betts, Craig Kimbrel, J. D. Martinez, Mitch Moreland, and Chris Sale. Betts led baseball in batting average and slugging percentage, while Martinez led in runs batted in. Sale tossed only 158 innings due to a shoulder injury late in the year, but was otherwise superb, posting a 2.11 earned run average to go along with 237 strikeouts. Kimbrel saved 42 games and struck out 96 batters. The Red Sox entered the postseason as the top seed in the American League, and defeated the Yankees in four games in the Division Series. Next, they defeated the defending champion Houston Astros in five games in the League Championship Series. Including their 2004 win that ended the Curse of the Bambino, this was the fourth World Series appearance by the Red Sox in 15 years and their 13th appearance all-time. Despite a 16–26 (.381) start to the season and nine losses in an 11 game stretch in mid-August, the Dodgers made the playoffs for the sixth straight year by winning the division in a Game 163 over the Rockies. At the July trade deadline, the team traded for All-Star shortstop Manny Machado from the Orioles to replace injured shortstop Corey Seager and a former All-Star second baseman Brian Dozier from the Twins. In August, the Dodgers acquired former World Series MVP David Freese from the Pirates. For the second year in a row, the Dodgers broke their franchise record for most team home runs in a season. With a 92–71 (.564) record, the team entered the playoffs as a second seed and went on to beat the Atlanta Braves in four games in the 2018 National League Division Series and the Milwaukee Brewers in seven games in the 2018 National League Championship Series, becoming the first team in either league to win Game 7 of a League Championship Series on the road since the 2006 Cardinals. The 2018 Dodgers were the first team to make the World Series by winning their tie-breaker game since the 2007 Colorado Rockies, who also faced Boston in that World Series. This was the Dodgers' fifth back-to-back World Series appearance. Two came in Brooklyn in 1952–1953 and 1955–1956, and two came in Los Angeles in 1965–1966 and 1977–1978. Overall, this was the Dodgers' 20th World Series appearance. Boston won the series, 4–1. Game 1: The national anthem was performed by James Taylor. Boston Hall of Famer Carl Yastrzemski threw the ceremonial first pitch, as he did before Game 1 in 2004, 2007, and 2013. The game ball was delivered by a member of the Boys & Girls Clubs of Boston, accompanied by Hall of Famer Jim Rice. Game 2: The national anthem was performed by the Boston Pops along with vocalists from the Boston Children's Chorus and the Tanglewood Festival Chorus. The ceremonial first pitch was thrown by members of the 2004 Red Sox championship team, including David Ortiz and Hall of Famer Pedro Martínez. While declining to throw a first pitch, Dodgers' manager Dave Roberts, who played on that championship team, greeted his former teammates. The game ball was delivered by a member of the Boys & Girls Clubs of Boston, accompanied by NESN announcer and former Red Sox All-Star second baseman Jerry Remy. Game 3: The national anthem was performed by Brad Paisley. The ceremonial first pitch was thrown by Hall of Famer and former Dodger player and manager Tommy Lasorda, who was accompanied on the field by Magic Johnson; the pitch was caught by former Dodger All-Star Steve Garvey. The game ball was delivered by a member of the Boys & Girls Clubs of West San Gabriel, accompanied by actor Mario Lopez. Game 4: A moment of silence was held to honor victims of the Pittsburgh synagogue shooting, which had happened that morning. The national anthem was performed by Ryan Tedder. The ceremonial first pitch was thrown by Hall of Famer Dennis Eckersley to former Dodger Kirk Gibson, recalling Gibson's game winning home run off of Eckersley in Game 1 of the 1988 World Series. The game ball was delivered by a member of the Boys & Girls Clubs of America, accompanied by actor Anthony Anderson. Game 5: The national anthem was performed by Petty Officer Second Class Mike Dalager of the United States Coast Guard. The ceremonial first pitch was thrown by former Dodger All-Star Orel Hershiser to former Dodger Mickey Hatcher. The game ball was delivered by a member of the Boys & Girls Clubs of America, accompanied by actor J. B. Smoove. Eduardo Núñez hit a three-run home run for Boston in the seventh inning. The Red Sox started Chris Sale against the Dodgers' Clayton Kershaw. Kershaw became the first pitcher to start the first game of the World Series in back-to-back years since Cliff Lee did so in 2009 (for the Phillies) and 2010 (for the Rangers) and the first to do so for the same team since Dave Stewart pitched three consecutive Game 1s for the Oakland Athletics from 1988 to 1990. The Red Sox struck in the first inning when Mookie Betts singled, stole second and then scored on a hit by Andrew Benintendi, who subsequently scored on a single by J. D. Martinez. Boston benefited from Dodgers' first baseman David Freese missing a foul pop-up by Betts, and right fielder Yasiel Puig allowing Benintendi to advance to second base on a late throw to the plate. A homer by Matt Kemp in the second inning gave the Dodgers a run, and an RBI single by Manny Machado in the third inning tied the score, 2–2. In the bottom of the third, Steve Pearce grounded into a fielder's choice—which was called an inning-ending double play on the field, but overturned by video review—and the Red Sox regained the lead on an RBI double by Martinez in the following at-bat. In the top of the fifth, a groundout by Machado plated Brian Dozier to even the score, 3–3. Sale wound up pitching into the fifth inning, allowing three runs on five hits and two walks with seven strikeouts. The Red Sox loaded the bases with no outs in the bottom of the fifth, and scored the go-ahead run when Xander Bogaerts grounded into a fielder's choice. A single by Rafael Devers off reliever Ryan Madson in the next at-bat made it 5–3. Kershaw's final line was five runs on seven hits and three walks with five strikeouts in four-plus innings. The Dodgers loaded the bases in the seventh off reliever Ryan Brasier and scored a run on a sacrifice fly by Machado. Eduardo Núñez hit a pinch-hit three run home run off Alex Wood in the bottom of the seventh to make it a four run lead for the Red Sox, 8–4, with no further scoring in the game. Boston reliever Matt Barnes, who finished the fifth inning after relieving Sale, got the win, while Kershaw took the loss for Los Angeles. Boston starter David Price got the win in Game 2, his second win of the 2018 postseason. Game 2 featured another matchup of left-handed pitchers; Boston started David Price, who got the win in Game 5 of the 2018 American League Championship Series, while Los Angeles started Hyun-jin Ryu, who took the loss in Game 6 of the 2018 National League Championship Series. The Red Sox again scored first, this time in the second inning, when Xander Bogaerts doubled and then scored on a single by Ian Kinsler. The Dodgers loaded the bases in the fourth inning and David Freese scored on a sacrifice fly by Matt Kemp to tie the game; Yasiel Puig then singled to drive in Manny Machado with the go-ahead run. After the Red Sox loaded the bases against Ryu in the bottom of the fifth, reliever Ryan Madson walked in the tying run and J. D. Martinez drove in two more with a single. Ryu's final line was four runs allowed on six hits and one walk with five strikeouts in 4​2⁄3 innings. Price only allowed two runs on three hits and three walks in six innings while striking out five. Both bullpens prevented more runs from scoring as the Red Sox won, 4–2, to take a two games to none lead. Ryu took the loss for the Dodgers, while Price earned the win for Boston with closer Craig Kimbrel getting his sixth save this postseason. It was also the 100th postseason victory in Red Sox franchise history. Max Muncy hit the game-winning home run in the 18th inning of Game 3. After two games started by left-handed pitchers, both teams started right-handed pitchers for Game 3; Walker Buehler for the Dodgers and Rick Porcello for the Red Sox. With no designated hitter, J. D. Martinez started in left field for the Red Sox, in place of usual left fielder Andrew Benintendi. The Dodgers scored first, for the first time in the series, when Joc Pederson homered in the third inning. Porcello pitched 4​2⁄3 innings, allowing the one run on three hits and one walk while striking out five. Buehler pitched seven scoreless innings allowing only two hits with no walks and seven strikeouts. Jackie Bradley Jr. hit a home run off Kenley Jansen with two outs in the eighth inning to tie the game. It was Jansen's first blown save in four opportunities this postseason. No one scored in the ninth and the game went into extra innings tied at one. In the 13th inning, Brock Holt walked, advanced on a wild pitch and scored the go-ahead run on an infield single by Eduardo Núñez and a throwing error by pitcher Scott Alexander. Then in the bottom of the inning, Max Muncy walked against Nathan Eovaldi, advanced to second on a pop out to Núñez in foul territory and then scored the tying run after an infield hit by Yasiel Puig and a throwing error by Ian Kinsler. Muncy hit a walk-off home run off Eovaldi in the 18th inning to win it for the Dodgers, 3–2, to cut their series deficit to 2–1. Eovaldi had just begun his seventh inning of relief. At 18 innings and seven hours and 20 minutes, this contest became the longest World Series game by both innings and time, surpassing (in playing time) Game 3 of the 2005 World Series, which lasted 14 innings and five hours and 41 minutes, and breaking the record (in innings) first set in Game 2 of the 1916 World Series, when the Red Sox and Dodgers (then known as the Robins) played 14 innings. Muncy tied the record for latest (18th inning) walk-off hit in postseason history, equalling Chris Burke in Game 4 of the 2005 National League Division Series. It was also the Dodgers' first game-winning World Series home run since Kirk Gibson in Game 1 of the 1988 World Series. The game took longer to play than the entire 1939 World Series, which had seven hours and five minutes of total playing time over four games. Steve Pearce had four RBIs and scored twice in Boston's Game 4 win. Following the longest game in World Series history, the Dodgers started Rich Hill while Eduardo Rodríguez made his first start of the postseason for the Red Sox. At 38 years old, Hill was the oldest player to start a World Series game since 39-year-old Tim Hudson started two games for the San Francisco Giants in 2014 and the oldest for the Dodgers since Sal Maglie in 1956. As he had pitched in relief in Game 3, Rodríguez became just the sixth pitcher in history to start a World Series game with zero days rest, and the first since Firpo Marberry of the Washington Senators in the 1924 World Series. The Red Sox had intended to start Nathan Eovaldi, but he needed rest after throwing 97 pitches in relief in Game 3. With no designated hitter, the Red Sox started an outfield of Andrew Benintendi, Mookie Betts, and J. D. Martinez, with Jackie Bradley Jr. on the bench in place of Benintendi, who did not start the previous game. The game was scoreless through the first five innings. In the bottom of the sixth, the Dodgers loaded the bases against Rodríguez and scored the game's first run on a throwing error by catcher Christian Vázquez. The next batter, Yasiel Puig, hit a three-run home run to extend the lead to 4–0. Rodríguez was taken out after 5​2⁄3 innings, allowing the four runs on four hits and two walks with six strikeouts. At that point, Red Sox ace Chris Sale made an angry speech that fired up his teammates in the dugout. In the top of the seventh, after striking out Eduardo Núñez with a runner on first, Hill was taken off the mound in favor of reliever Ryan Madson, a decision by Roberts which was criticized by several including President Donald Trump. Mitch Moreland hit a three-run pinch-hit home run off of Madson to make it a one run game. Hill was charged with one run in ​6 1⁄3 innings on one hit and three walks with seven strikeouts. Madson set a new World Series record by allowing seven inherited runners to score in the series. Steve Pearce hit a homer off Kenley Jansen in the eighth inning. This was the second straight day Jansen allowed a game tying home run in that inning. Jansen became just the second pitcher in World Series history to allow game-tying home runs in back-to-back games (Byung-hyun Kim for the Arizona Diamondbacks in 2001 was the other). In the top of the ninth, Brock Holt doubled off Dylan Floro and was driven in by a single by pinch hitter Rafael Devers to give Boston their first lead of the game. The Red Sox loaded the bases against Floro and Alex Wood and then Pearce doubled to right center off Kenta Maeda, scoring all three runs to put the Red Sox up, 8–4. They added another run when Xander Bogaerts drove in Pearce with a single. Kiké Hernández hit a two-run homer off of Craig Kimbrel in the ninth to cut the lead to three. Kimbrel was able to get the last three outs and the Red Sox took a three games to one lead. Alex Cora, seen here as a player in 2008, led the Red Sox to the World Series championship in his first year as manager. On October 28, Los Angeles became the first city to host an MLB, NFL (Rams), NHL (Kings), MLS (Galaxy) and NBA (Clippers) game all on the same day. Clayton Kershaw started for the Dodgers, while David Price started for the Red Sox. Price became the first pitcher to start World Series games no more than four days apart while also pitching in relief between those games since Jack Billingham of the Cincinnati Reds did so in the 1972 World Series. Jackie Bradley Jr. again did not start in the outfield for Boston, but entered the game as a defensive replacement in the bottom of the ninth inning. Both teams scored in the first inning. The Red Sox scored in the top of the inning after a one out single by Andrew Benintendi followed by a two-run home run by Steve Pearce. David Freese led off the bottom of the inning with a home run for the Dodgers. No one else scored until the sixth inning, when Mookie Betts hit a home run with one out and then J. D. Martinez hit a lead-off homer in the seventh to make it 4–1. Kershaw pitched seven innings, allowing four runs on seven hits, with five strikeouts and no walks. In the eighth inning, Pearce hit another home run, this time off of Pedro Báez. Price pitched into the eighth, allowing only one run on three hits and two walks while striking out five. He became just the fifth pitcher to pitch 6+ innings and allow three or fewer hits in three straight postseason starts. Joe Kelly and Chris Sale pitched the last two innings and both struck out the side, Sale getting Manny Machado to strike out for the last out, the Red Sox winning the game 5–1 and the title 4–1. Pearce won the World Series Most Valuable Player Award. 2018 World Series (4–1): Boston Red Sox beat Los Angeles Dodgers. Winning player's share: $416,838.72. Losing player's share: $262,027.49. The World Series was televised nationally by Fox for the 19th straight year. Joe Buck was the play-by-play announcer, with John Smoltz as the color commentator. Ken Rosenthal and Tom Verducci were the field reporters. Fox Deportes offered a Spanish-language feed, with Rolando Nichols providing play-by-play and Carlos Álvarez and Edgar Gonzalez doing color commentary. Outside of the United States, MLB International carried the series with play-by-play by Matt Vasgersian and color commentary by Buck Martinez. ESPN Radio broadcast all the World Series games in English for the 21st straight year as part of Major League Baseball on ESPN Radio. Dan Shulman called the play-by-play, with Chris Singleton serving as color analyst and Buster Olney as field reporter. Marc Kestecher hosted the pre-game show with Olney and Tim Kurkjian reporting. Jon Sciambi called the play-by-play for Game 5 due to Shulman developing laryngitis. ESPN Deportes Radio provided Spanish-language coverage of the Series. Eduardo Ortega called the play-by-play and Orlando Hernández, Renato Bermudez, and José Francisco Rivera served as analysts. Locally, both teams' flagship radio stations broadcast the series with their regular announcers, which were simulcast over SiriusXM radio. In Los Angeles, the broadcast was on AM 570 LA Sports with Charley Steiner and Rick Monday in English, on Univision America 1020 with Jaime Jarrín and Jorge Jarrín in Spanish, and on Radio Korea 1540 AM in Korean. The Red Sox broadcast was on WEEI 93.7 FM in English with Joe Castiglione, Tim Neverett and Lou Merloni, and in Spanish on WCCM 1490 AM with Uri Berenguer. The Red Sox held a victory parade in Boston on October 31. The 2018 World Series was sponsored by YouTube TV, the second consecutive year that the service sponsored the series. This sponsorship included logo branding in-stadium and on official digital properties, on the field, as well as commercial inventory during Fox's telecasts of the games. 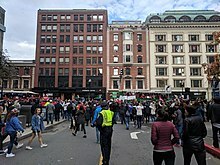 On the morning of October 31, a Red Sox celebration parade began at Fenway Park and made its way downtown to its final destination on Staniford Street. During the celebration, the World Series trophy sustained minor damage from a beer can thrown by a spectator; it was subsequently repaired. An 80-minute documentary, 2018 World Series: Damage Done, which was produced by MLB and narrated by Uzo Aduba, was released on December 4. On December 3, Red Sox president Sam Kennedy announced that team accepted an invitation to visit the White House. Originally planned for February 15, 2019, the visit was postponed to May 9, 2019, due to the 2018–19 United States federal government shutdown. ^ "2018 World Series Umpire Crew and Roster". www.closecallsports.com. Retrieved October 22, 2018. ^ Simon, Andrew; Kelly, Matt (October 28, 2018). "Rookie managers who won the World Series". MLB.com. Retrieved October 29, 2018. ^ Abdeldaiem, Alaa (October 29, 2018). "Red Sox Manager Alex Cora Wants to Take World Series Trophy to Puerto Rico After Win". Sports Illustrated. Retrieved October 29, 2018. ^ "A World Series Matchup That's a Long Time Coming". The New York Times. October 22, 2018. Retrieved October 27, 2018. ^ Yates, Clinton (October 23, 2018). "Boston is the perfect place for the World Series to make history". The Undefeated. Retrieved October 24, 2018. ^ "Former teammates Dave Roberts, Alex Cora make history with Dodgers-Red Sox World Series". October 23, 2018. Retrieved October 27, 2018. ^ Associated, The (October 4, 2018). "Here's what you need to know before the Red Sox-Yankees ALDS". Boston.com. Retrieved October 27, 2018. ^ AP. "Boston Red Sox become first team in majors to clinch playoff spot". Usatoday.com. Retrieved October 27, 2018. ^ Fitzpatrick, Mike (September 21, 2018). "Red Sox clinch AL East title with win against the Yankees". Boston.com. AP. Retrieved September 21, 2018. ^ "Boston Red Sox survive late threat from New York Yankees to reach ALCS". Espn.com. October 10, 2018. Retrieved October 27, 2018. ^ Acquavella, Katherine (October 19, 2018). 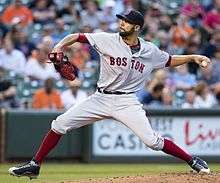 "Red Sox vs. Astros score: Boston is World Series-bound thanks to David Price's gem on short rest". CBSSports.com. Retrieved October 27, 2018. ^ "Dodgers set franchise record for home runs in a season for second consecutive year". TrueBlueLA.com. September 22, 2018. Retrieved September 22, 2018. 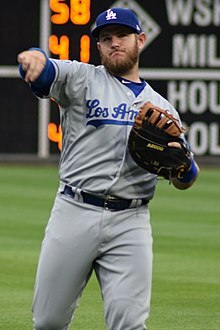 ^ "MLB – In the end, Los Angeles Dodgers' talent trumps Milwaukee Brewers' moves". Espn.com. October 21, 2018. Retrieved October 27, 2018. ^ "Dodgers Defeat the Brewers in the N.L.C.S. to Return to the World Series". Retrieved October 27, 2018. ^ "Boxscore: Los Angeles vs. Boston, Game 1". MLB.com. Retrieved October 23, 2018. ^ "Boxscore: Los Angeles vs. Boston, Game 2". MLB.com. Retrieved October 24, 2018. ^ "Boxscore: Boston vs. Los Angeles, Game 3". MLB.com. Retrieved October 26, 2018. ^ "Boxscore: Boston vs. Los Angeles, Game 4". MLB.com. Retrieved October 27, 2018. ^ "Boxscore: Boston vs. Los Angeles, Game 5". MLB.com. Retrieved October 28, 2018. ^ "James Taylor performs the national anthem before Game 1 of the World Series". MLB.com. October 23, 2018. Retrieved October 24, 2018 – via YouTube. ^ @WEEI (October 23, 2018). "First pitch from Yaz. Let's go!" (Tweet). Retrieved October 23, 2018 – via Twitter. ^ "Carl Yastrzemski throws ceremonial first pitch of World Series". WCVB-TV. October 23, 2018. Retrieved October 23, 2018. ^ "Ceremonial & off-field activities for Games One and Two of the 2018 World Series presented by YouTube TV". MLB.com. October 23, 2018. Retrieved October 23, 2018. ^ Hartwell, Darren (October 23, 2018). "These Red Sox Icons Will Throw Out First Pitch At World Series Game 1, Game 2". NESN. Retrieved October 23, 2018. ^ @OnlyInBOS (October 24, 2018). "14 years later" (Tweet). Retrieved October 24, 2018 – via Twitter. ^ "World Series notes: Dave Roberts declines first-pitch honor at Fenway". Los Angeles Times. October 23, 2018. Retrieved October 24, 2018. ^ Garro, Adrian (October 24, 2018). "Dave Roberts couldn't help but say hello to his pals on the 2004 Red Sox before their Game 2 first pitch". MLB.com. Retrieved October 24, 2018. ^ "Members of 2004 Red Sox play major roles in ceremonies prior to Game 2". The Boston Globe. October 23, 2018. Retrieved October 23, 2018 – via Boston.com. ^ a b c Footer, Alyson (October 26, 2018). "Lasorda center of pregame ceremony in LA". MLB.com. Retrieved October 26, 2018. ^ "Pittsburgh stars, teams express support in wake of deadly synagogue shooting". ESPN. October 27, 2018. Retrieved October 30, 2018. ^ a b "Ceremonial & off-field activities for Game Four of the 2018 World Series presented by YouTube TV". MLB.com. October 27, 2018. Retrieved October 27, 2018. ^ Garro, Adrian (October 26, 2018). "Kirk Gibson and Dennis Eckersley teamed up for a ceremonial first pitch before Game 4 of the World Series". MLB.com. Retrieved October 26, 2018. ^ @DieterRuehle (October 28, 2018). "Excited to accompany US Coast Guard Petty Officer Second Class, Mike Dalager, on the anthem today" (Tweet). Retrieved October 28, 2018 – via Twitter. ^ @TomLeyden (October 28, 2018). "Orel Hershiser throws our first pitch and Mickey Hatcher drops it" (Tweet). Retrieved October 28, 2018 – via Twitter. ^ "World Series - Boston Red Sox v Los Angeles Dodgers - Game Five". Getty Images. October 28, 2018. Retrieved October 28, 2018. ^ "WS Game 1 starters". Baseball Reference. Retrieved October 23, 2018. ^ Axisa, Mike (October 24, 2018). "MLB World Series 2018: The Dodgers kept making mistakes and the Red Sox kept capitalizing in Game 1". CBS Sports. Retrieved October 24, 2018. ^ "Eduardo Nunez blast powers Red Sox past Dodgers in World Series Game 1". The Guardian. Associated Press. October 24, 2018. Retrieved October 24, 2018. ^ Castrovince, Anthony (October 23, 2018). "Hot Red Sox bats chill Dodgers in Game 1". mlb.com. Retrieved October 23, 2018. ^ Connolly, Daniel (October 24, 2018). "Former UConn Pitcher Matt Barnes Earns Win in Game One of World Series". The UConn Blog. Retrieved October 27, 2018. ^ Felt, Hunter (October 25, 2018). "David Price and bullpen star as Red Sox take 2–0 World Series lead over Dodgers". Guardian. Retrieved October 25, 2018. ^ Castrovince, Anthony (October 24, 2018). "J.D. 's decisive knock derails LA, puts Sox up 2–0". mlb.com. Retrieved October 24, 2018. ^ "History bodes well for Red Sox' 2–0 World Series lead". NBC Sports. October 24, 2018. Retrieved October 25, 2018. ^ @dailyrotonews (October 26, 2018). "DailyRoto Lineup Alert: Red Sox" (Tweet). Retrieved October 26, 2018 – via Twitter. ^ Axisa, Mike. "World Series Game 3: Jackie Bradley Jr. stuns Dodger Stadium with game-tying homer off Kenley Jansen". CBSSports.com. Retrieved October 27, 2018. ^ "World Series Game 3: Boston Red Sox 2-3 Los Angeles Dodgers – as it happened!". Guardian. October 27, 2018. Retrieved October 31, 2018. ^ Castrovince, Anthony (October 27, 2018). "Dodgers walk off on Muncy's HR in 18th inning". mlb.com. Retrieved October 27, 2018. ^ McIntosh, Whitney (October 27, 2018). "World Series Game 3 was the longest game in postseason history". SB Nation. Retrieved October 27, 2018. ^ Minami, Craig (October 27, 2018). "Dodgers try to ride momentum into Game 4". SB Nation. Retrieved October 27, 2018. ^ Kramer, Daniel (October 27, 2018). "E-Rod to start Game 4 for Red Sox". mlb.com. Retrieved October 27, 2018. ^ "World Series 2018: Red Sox's Nathan Eovaldi has a game for the ages, even as losing pitcher". Sporting News. October 27, 2018. Retrieved November 19, 2018. ^ @PeteAbe (October 27, 2018). "Game 4" (Tweet) – via Twitter. ^ "Scared straight: Chris Sale motivates Red Sox with rant during Game 4 of World Series". USA TODAY. ^ "Rich Hill revealed another strange Dodgers decision from the World Series". November 28, 2018. ^ "World Series 2018 Game 4: Boston Red Sox 9-6 Los Angeles Dodgers – as it happened". Guardian. October 28, 2018. Retrieved October 31, 2018. ^ Castrovince, Anthony (October 27, 2018). "Late surge gives Sox 3-1 Series edge over LA". mlb.com. Retrieved October 27, 2018. ^ "Dodgers' World Series win ensures Game 5 ... and a historic 'Sports Equinox". Los Angeles Sports Equinox. October 27, 2018. ^ Snyder, Matt. "Red Sox vs. Dodgers: Rich Hill gets the starting nod for World Series Game 4 after all". CBSSports.com. Retrieved October 28, 2018. ^ Vautour, Matt (October 28, 2018). "David Price World Series Game 5: Alex Cora moves up lefty to start potential clinching game for Boston Red Sox". MassLive.com. Retrieved October 28, 2018. ^ Buster OlneyVerified account (November 9, 2009). "Buster Olney on Twitter: "ELIAS: David Price started Game 2 on Wednesday and pitched in relief in Game 3 on Friday He will be the first pitcher to start Ws games no more than four days apart while also pitching in relief between those starts since Jack Billingham did so for the Reds against OAK in 1972."". Twitter.com. Retrieved October 29, 2018. ^ @ArashMarkazi (October 28, 2018). "#WorldSeries Game 5 Lineups:" (Tweet). Retrieved October 28, 2018 – via Twitter. ^ "Boston Red Sox beat Los Angeles Dodgers to win 2018 World Series – as it happened". Guardian. October 29, 2018. Retrieved October 31, 2018. ^ Stats By STATS (April 8, 2009). "Stats By STATS on Twitter: "With seven innings and three hits allowed, @RedSox David Price is the fifth pitcher ever to pitch 6+ innings and allow three hits or fewer in 3 straight postseason starts. Price joins Jon Matlack (1973), Mike Mussina (1997), Kevin Brown (1998), and Clayton Kershaw (2013)."". Twitter.com. Retrieved October 29, 2018. ^ Castrovince, Anthony (October 28, 2018). "Red Sox roll to 4th World Series title since 2004". MLB.com. Retrieved October 28, 2018. ^ Bill Baer (October 29, 2018). "Steve Pearce named MVP of World Series". HardballTalk. ^ a b "Full share for WS champion Red Sox set at $416K". ESPN. AP. November 26, 2018. Retrieved November 26, 2018. ^ a b "2018 MLB Postseason Schedule". MLB.com. MLB Advanced Media. Retrieved October 21, 2018. ^ a b Lucia, Joe (October 22, 2018). "Your 2018 World Series announcing schedule". Awful Announcing. Retrieved October 26, 2018. ^ Pucci, Douglas (October 24, 2018). "Tuesday Final Ratings: Dodgers-Red Sox Draw Four-Year Low for a World Series Game One on Fox". programminginsider.com. Retrieved October 24, 2018. ^ Pucci, Douglas (October 25, 2018). "Wednesday Final Ratings: World Series on Fox at Four-Year Low Through Two Games". programminginsider.com. Retrieved October 25, 2018. ^ Pucci, Douglas (October 29, 2018). "Friday Final Ratings: 18-Inning World Series Game Three Helps Fox Quadruple the Runner-Up Network Among Adults 18-49". programminginsider.com. Retrieved October 29, 2018. ^ Pucci, Douglas (October 30, 2018). "Saturday Final Ratings: Fox, with World Series Game Four, More Than Triples Runner-Up ABC Among Adults 18-49". programminginsider.com. Retrieved November 1, 2018. ^ Pucci, Douglas (October 30, 2018). "Sunday Final Ratings: World Series Game Five on Fox Bests Competing 'Sunday Night Football' NBC Telecast for Third Straight Year". programminginsider.com. Retrieved October 30, 2018. ^ Rosvoglou, Chris (October 28, 2018). "ESPN Announcer Forced To Miss Game 5 Of The World Series". The Spun. Retrieved October 28, 2018. ^ Skarka, Michael (October 19, 2018). "ESPN's Extensive On-Site Coverage of the Major League Baseball World Series" (Press release). ESPN Media Zone. Retrieved October 20, 2018. ^ "Your 2018 World Series announcing schedule". Awful Announcing. October 22, 2018. Retrieved October 23, 2018. ^ "Dodgers vs. Red Sox Preview". MLB.com. Retrieved October 23, 2018. ^ "남가주 한인사회 2018 월드시리즈로 들썩! .. 라디오코리아 생중계" (in Korean). Radio Korea. October 22, 2018. Retrieved October 23, 2018. ^ Lefton, Terry; Ourand, John. "YouTube TV Digital Pay Service Signs On To Be First World Series Presenting Sponsor". Sports Business Journal. Retrieved September 6, 2018. ^ "Red Sox World Series Victory Parade". Boston.gov. October 31, 2018. Retrieved October 31, 2018. ^ "Everything you need to know for the 2018 Red Sox World Series parade". Boston.com. October 31, 2018. Retrieved October 31, 2018. ^ "World Series trophy repaired after parade damage". USA Today. AP. November 1, 2018. Retrieved November 26, 2018. ^ Browne, Ian (November 28, 2018). "World Series doc captures historic Sox moments". MLB.com. Retrieved November 30, 2018. ^ Bird, Hayden (December 4, 2018). "5 takeaways from the Red Sox' World Series documentary". Boston.com. Retrieved December 4, 2018. ^ Mastrodonato, Jason (December 3, 2018). "Red Sox, Alex Cora accept invitation to the White House". Boston Herald. Retrieved December 3, 2018. ^ "Boston Red Sox push back trip to White House until May". USA Today. AP. January 25, 2019. Retrieved April 21, 2019. Bird, Hayden (October 29, 2018). "9 weird and obscure stats from the Red Sox' World Series win". Boston.com. Retrieved October 29, 2018. Browne, Ian (October 23, 2018). "Pomeranz on, Workman, Wright off Sox roster". MLB.com. Retrieved October 23, 2018. DeCosta-Klipa, Nik (October 23, 2018). "Yes, that was Bill Belichick doing the voiceover for FOX's World Series hype video". Boston.com. Retrieved October 24, 2018. Miller, Sam (October 29, 2018). "Red Sox starters won the World Series -- from the bullpen". ESPN. Retrieved October 29, 2018. Park, Do-Hyoung (October 21, 2018). "Fun facts about only other Red Sox-Dodgers WS". MLB.com. Retrieved October 22, 2018. Rosenstein, Mike (October 25, 2018). "World Series 2018: Did Red Sox snub Curt Schilling on ceremonial 1st pitch?". NJ.com. Retrieved October 25, 2018. Simon, Andrew (October 20, 2018). "Teams that lost WS and returned the next year". MLB.com. Retrieved October 20, 2018. Simon, Andrew; Randhawa, Manny (October 27, 2018). "18 amazing facts from marathon Game 3 of WS". MLB.com. Retrieved October 27, 2018. Walker, Ben (October 20, 2018). "Dodgers-Red Sox: Rich histories, but little crossover". Boston.com. AP. Retrieved October 20, 2018. Yang, Nicole (October 27, 2018). "13 mind-boggling stats from the longest World Series game ever". Boston.com. Retrieved October 27, 2018.